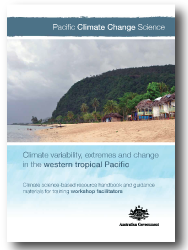 The training package will assist staff in national meteorological services in the Pacific islands and other relevant organisations to communicate the climate science reported in PACCSAP tools and publications—and turn today’s climate science into tomorrow’s climate service. publications, tools and resources developed through the PACCSAP program (see Publications & resources). © Copyright pacificclimatechangescience.org. All rights reserved. Please note that the Disclaimers for the Bureau of Meteorology and CSIRO apply also to this site.